Sean DeWitt works closely with our partner RUMA as a Program Manager at the Grameen Foundation. We at Grameen Foundation congratulate our implementing partner in Indonesia, RUMA on its first prize in the Harvard Social Enterprise “Pitch for Change” competition! Harvard University hosted its annual Social Enterprise conference on February 27-28, 2010. This year’s event attracted more than 1,300 attendees. The vibe was refreshing and dynamic, reflecting the infectious energy of the students in attendance but also the momentum that the concept of social enterprise has gained in the 2-3 years. As part of its core activities, Harvard included a “Pitch for Change” competition to help expose exciting new social business ideas to the audience. More than a hundred entries were pre-screened and 16 semi-finalists were chosen to pitch in front of the judging panel. One of the semi-finalists chosen was a startup social enterprise in Indonesia called RUMA (an acronym that translates to “Your Micro Business Partner”). The concept was submitted by Aldi Haryopratomo, who co-founded the RUMA social enterprise along with Budiman Wikarsa, both leaving the comfortable world of strategy consulting to build their dream in Indonesia. Their dream is to invest the dollars and energy necessary to build a network of entrepreneurs among poor women in Indonesia who will retail valuable products and services to their communities. RUMA is determined to focus this energy to help the poor and poorest to pull themselves out of poverty. As such, RUMA is utilizing a poverty scorecard developed by Grameen Foundation to measure the baseline level of poverty of its entrepreneurs and to measure this level of poverty over time to ensure their initiative is achieving its intended outcomes in poverty alleviation. I didn’t know what to expect when my plane approached Port au Prince, Haiti, a little more than one week ago. Like many people around the world, I had been working hard to help Fonkoze, Haiti’s largest microfinance institution, since it was devastated by the January 12 earthquake. I acted in my capacities as President of Grameen Foundation, which has a long-standing relationship with Fonkoze, and as the volunteer Chairman of Fonkoze USA. Some of the reports I’d received from Fonkoze after the earthquake were depressing: food and fuel shortages, growing death tolls of Fonkoze staff and clients, homes and businesses destroyed, survivors enduring maddeningly slow recovery from injuries (their progress often stunted due to intensive work against doctor’s orders). Others reports were inspirational: the U.S. military’s heroic, James Bond-esque effort in the dead of night to transport $2 million in cash from the US to Fonkoze’s 40 branches via helicopters (so that clients could withdraw savings and remittances), the successful pilot of a “mobile branch in a van,” and, above all, the tower of strength that Anne Hastings and her team displayed to me and millions of others once communications were restored and a plan for recovery could be developed and shared. Peg Ross is the Director of Grameen Foundation’s Human Capital Center. Spend time at a microfinance institution (MFI) and you’ll be impressed with the resilience and resourcefulness of people who are usually out of the spotlight: the mid-level managers charged with running day-to-day operations. Much like managers at a typical commercial bank, the way they deal with challenges or crises and effectively manage their teams can significantly impact the entire organization. This impact is felt more acutely given the microfinance industry’s uniquely personalized approach and social focus. In many respects, these managers are the backbone of their organizations, and the future of an industry that is expanding rapidly. But not enough is being done to develop the “middle-manager muscle” they need to help them perform better at their current jobs or to develop the skills they will need as future leaders. This challenge was captured in a recent paper, No Footsteps to Follow, which documents conversations with microfinance practitioners on the impact human capital issues can have on organizational growth. That initial exploration is part of a larger initiative focused on strengthening the leadership capabilities of the next generation of microfinance leaders. While we’re focusing initially on India as our incubator country, we intend to develop a solution that can be adopted more globally. Last Thursday and Friday, we joined colleagues from Continuum, the Center for Creative Leadership and ShoreCap Exchange to plan our immersion field research and to discuss how we’ll use design thinking as our approach to navigate these largely uncharted waters. Design thinking is emerging as a new way for organizations to develop innovative solutions to social problems (the Stanford Social Innovation Review offers a great overview). It is based on the simple logic that solutions are much more effective when you put those whom the solutions are meant to serve at the center of your work. Direct observation helps to uncover what they actually need and not what you think they do. Throughout our field research this coming May, we will be talking with and observing mid-level managers at six MFIs in India. We will also be talking to those who interact with them at various levels, ranging from field officers to CEOs to local government officials to clients (especially if the middle-manager started as a field officer and came up through the ranks). This will help us to construct a clearer picture of the challenges and opportunities they face and what type of leadership development solution might be of help. International Women’s Day – What does it mean? 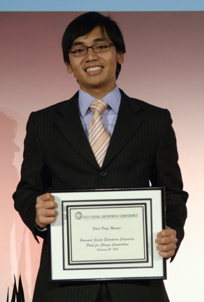 Darwin Cruz is Online Communications Officer for the Grameen Foundation. Today is International Women’s Day. I first learned about this holiday a few years ago. Back then, I didn’t understand the nature of the celebration or why it’s been celebrated for the past 100 years. But now I realize that though in the US it’s not yet a major holiday, around the world this day has a big impact. Yet if the injustices that women in poor countries suffer are of paramount importance, in an economic and geopolitical sense the opportunity they represent is even greater. “Women hold up half the sky,” in the words of a Chinese saying, yet that’s mostly an aspiration: in a large slice of the world, girls are uneducated and women marginalized, and it’s not an accident that those same countries are disproportionately mired in poverty and riven by fundamentalism and chaos.